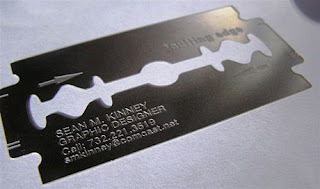 The best Business card I have ever come across. I just want to meet the creative brain that worked behind this master piece. I am standing and typing this line. The pause was due to the fact that I was giving a standing ovation. Great idea. surely a cutting edge technology!! hey man! this one is super cool!!!! where did ya get this from? Brilliant! So much better than the staid commonplace ones! haha I dun think I need ur business card then! OUCH! mmm... wokey wokey.. hold on..
jokes apart, creativity neva works with a stopgap arrangement.. n this one is gud!